In 2001, I went to a conference near San Diego, held at the Hotel del Coronado. Driving from the city of San Diego to the Island of Coronado, one must cross the Coronado Bay Bridge. As Route 75 curves over the bay, the bridge is marked with blue signs with white lettering. These signs inform all who pass that a suicide counseling team is available 24 hours a day. I was struck by how the natural beauty of this place could not counteract the will for some to end their lives. I thought of how so many, myself included, long for a room with a view. I wonder what it would take for some to just keep driving over the bridge – to a room with a view, where they might have a moment of rest from their deep sadness. 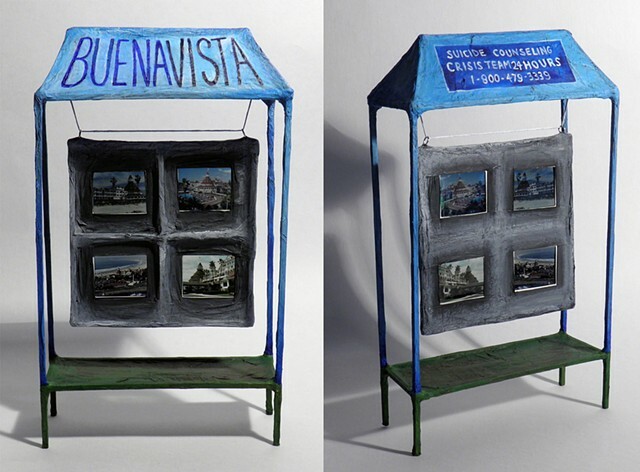 In this piece, I use found promotional slides of the hotel in a floating window, enshrined below the words often used to describe its luxury rooms: Buena Vista.